Pastor Charles Johnson is our pastor. 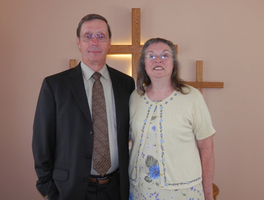 He has been pastoring for 42 years in independent Bible and Baptist churches. He has a BS Degree in Bible from Philadelphia College of Bible, which is now named Carian University in Langhorne, Pennsylvania. He earned his MM degree at Bethany Theological Seminary in Dothan, Alabama. Pastor Johnson has (and is) been married to Linda for 47 years. They have 5 children and 13 grandchildren. Pastor has served in the Army for two years and is a veteran of the Vietnam War, serving with the 11th Armored Cavalry Regiment. He and Linda have served the Lord with Child Evangelism Fellowship as State Director of New Jersey and Director of the Children's Ministry Institute in Warrenton, Missouri. They are now serving the Lord as missionaries with Handi*Vangelism Ministries, Inc. as Regional Directors in Delaware.